It's been awhile since I had some real time in the kitchen and thankfully, I had this wonderful Saturday ahead of me to cook and bake to my heart's content! To start off this warm and cozy Saturday morning, I made myself some breakfast... a breakfast I've been craving all week. To make in advance, prepare the recipe as written and once cooked, place the pancakes on a cooling rack. Once cooled, stack the pancakes with a piece of parchment paper in between each one and place in a freezer safe storage bag. For additional protection, you could wrap the stack of pancakes in foil before placing in the storage bag. When you're ready to enjoy them, just take however many you want from the freezer (the parchment paper really helps to prevent them from sticking together) and heat them in the microwave for about a minute from frozen or 20-30 seconds if you allow the pancakes to thaw or come to room temperature before heating. Keep in mind, you can also omit the blueberries completely or substitute them with any fruit that you like including strawberries, bananas, or even chocolate chips! In a medium bowl, combine all the dry ingredients (flour, sugar, sugar, salt, baking powder and baking soda). Use a whisk to blend together. In a 4 cup measuring cup or another medium bowl, combine the remaining ingredients except the blueberries and vegetable oil (buttermilk, sour cream, eggs and melted butter) with a whisk. Make a well in the center of the dry ingredients and pour in the wet ingredients. Stir the wet mixture in gently with the dry ingredients just until it starts to fully combine. The batter will be a bit lumpy. If you see streaks of flour, it's okay, but just don't overmix! Let the lumpy batter sit aside for about 10 minutes before you start cooking. To prepare for cooking, use a 10- or 12- inch nonstick skillet and heat 1 teaspoon of oil or spray with cooking spray. Heat a 12-inch nonstick skillet over medium heat and spray with cooking spray enough to coat the bottom. Once the pan gets hot, carefully wipe some off the cooking spray from the pan with a pape towel. I like using a large scoop or even a small soup ladle to measure my pancake batter. You can also use a 1/4 cup measure if you prefer. Take a scoop/ladle or 1/4 cup full of batter and pour into your hot skillet. You should be able to fit 4 small pancakes in a pan, but fit whatever works for you. 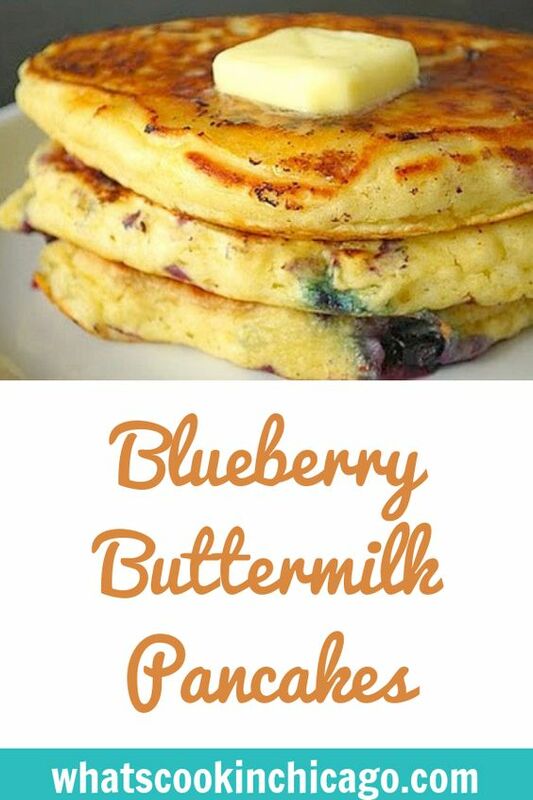 Top the pancakes with a sprinkle of blueberries once you pour them into the pan. Cook the pancakes until the edges start to bubble, which means it's starting to set. Take a peek at the bottom of the pancake to see if it's golden brown and that the pancakes start to form bubbles that break on the top of the pancake. At this point, you can flip the pancakes with a spatula. Continue to cook the second side until golden brown. Serve the pancakes immediately or to keep warm, transfer them onto a wire rack set in a 200 degree oven. These pancakes look great! Thanks for the storage tips. 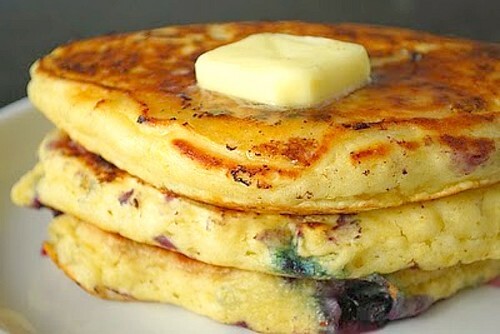 I love blueberry pancakes! And I esp love making them from scratch. Thanks for sharing this recipe, I can't wait to try this at home! These look so good!! I love breakfast. Elizabeth, these make 10 large pancakes or 16-18 small ones. Trying to get ready for a new little one to join us! Need as much food prepared as possible! Could you freeze these after cooking them? Hi Anonymous - yes, you can definitely freeze these after cooking. I toast them in a toaster oven to warm up and get a little crisp! I made these tonight for dinner and the extras will go in my very pregnant daughter's freezer (due in early September). They were fabulous. I thought uh oh when I saw sour cream as an ingredient, and left the lumps in, and they were light as a feather. Will definitely make again. I'm in heavy nesting mode-and the recipe's on this site look wonderful- next up chicken kiev.